So, while “networking on social media” (translation: while wasting time on Facebook, drinking coffee in my underwear) I came across an extremely cool announcement from the Grim Tidings Podcast called “Seven Days of Salvatore.” It was a tribute to the prolific and beloved works of R.A. Salvatore (namely, everyone’s favorite Dark Elf, Drizzt Do’Urden) and the upcoming GTP interview with the man himself on 9/12/2015. It made me smile. A lot. Memories of my shelf-full of Salvatore books and the bazillion little dreams of heroic fantasy they’ve spawned has that effect on me. I first encountered Mr. Salvatore’s work at an impressionable age. I was about 13 when I spotted a copy of “The Crystal Shard” (Salvatore’s debut novel and the world’s introduction to Drizzt) on the bookstore shelf in the Summer of 1989. More on that in just a bit. I had five bucks in my pocket and a hole in my dice bag, which I’d come to remedy. My mom was in a hurry to get going, so I didn’t have much time to ponder it. For some reason, I decided to buy that book instead. That was a moment, that quite literally, changed my life. Seeing GTP’s upcoming interview with R.A. Salvatore made me think back on that. More specifically, it had me pondering what I as a fantasy writer owe to Bob Salvatore. His influence on me was huge, no doubt. But where did it start? While eating my breakfast this morning, it hit me like a lightning bolt. Tolkien made me fall in love with Fantasy. But Salvatore made me think I could write fantasy. 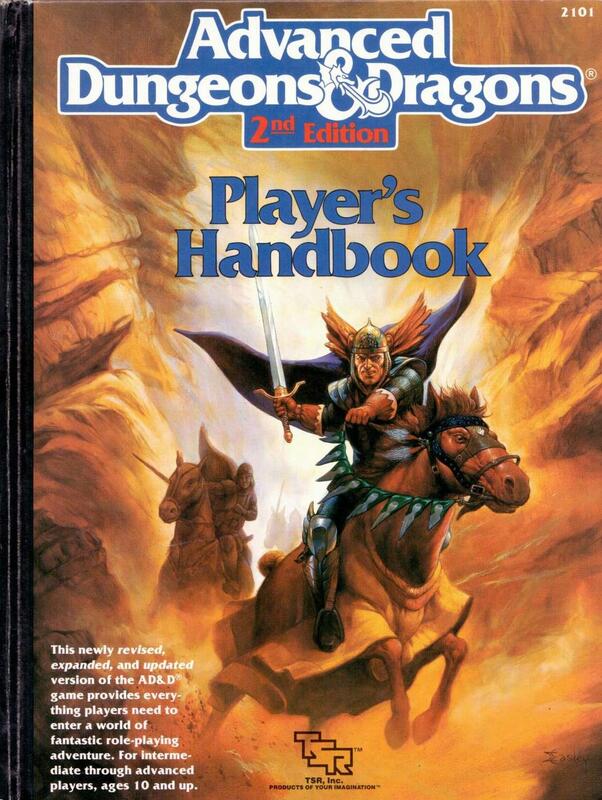 So there I was, 13 years old, standing in D&D Section of a B.Dalton Bookseller in the Northpark Mall in Joplin, MO. It was the Summer of 1989. For you Elder Gamer Geeks (like me), this time period requires no explanation. For everybody else — in the Summer of 1989 AD&D 2nd Edition had just hit the shelves. It was new and freaky and tumultuous. There was some gnashing of teeth among long-term First Edition and Red Box adherents. There always is when a new edition of “your very most favorite game” is released. I’d been playing 1st Edition AD&D since I was 10 or so, so for me, every trip to the ANY bookstore included me going straight to the D&D section to drool over the shiny new books. Especially all those super-cool new ones with the brand new AD&D 2nd Edition Logo on them. (Yes, baby, come to daddy). That day was no different. Somewhere prior to my arrival that day though, some ingenious plan-o-gram designer had decided to include an end cap on that aisle of TSR Forgotten Realms Novels. That caught my eye. 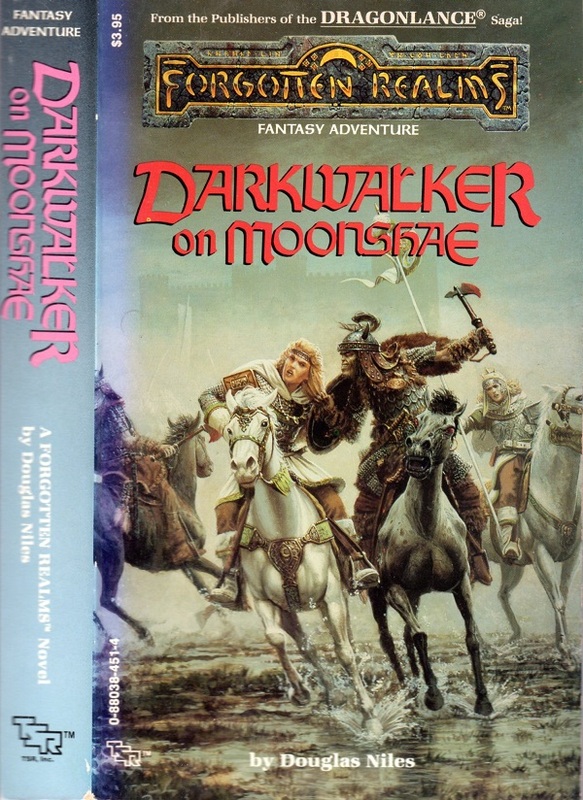 I mean, I’d already read Douglas Niles’ “Darkwalker on Moonshae” (which had THE most freakin’ METAL cover of any fantasy book I owned at the time). So, I was a 13 year old expert who’d read one Forgotten Realms book. Sure, I was down for more. I knew what was up. And I said, “Um… is that a Dark Elf?” I even remember picking it up and muttering “What the hell?” — then looking around sheepishly hoping my Mom didn’t overhear me. She didn’t. Whew. Replacing my dice bag was momentarily forgotten (which was good, because I eventually scored my very first purple velvet Crown Royal bag about a week later and those have been my dice bags ever since. I still have my very first one). I read the back cover. It was a Dark Elf. His name was Dri-ST…. Drizz-IT… Drizz…. It was a Dark Elf. That was good enough for me. I didn’t know why the hell this R. A. Salvatore guy had written a book about some Dark Elf and some Evil Artifact, but hell, that seemed cool. Then Mom hollered at me. It was time to go. With no time to contemplate the gravity of my choice, I abandoned my search for a dice bag, ran up to the registers, and bought my weird Dark Elf book instead. I started reading it on the way home in the car. Holy crap, man. This Dark Elf was a RANGER. Like a REAL Ranger. In the frozen wastelands. He didn’t even live in the Underdark. He was in some kind of exile. Doing… good things? Who the hell ever would have thought of that?!?!? I flipped back to the front cover. Huh, I guess this R.A. Salvatore guy, that’s who. Me and my (now coveted) copy of “The Crystal Shard” went home. I kicked back on the couch in my sock feet with some Cheetos and continued to read. I repeated this ritual for a couple of days, sucked into this story as if it were a black hole. I won’t lie, I skipped to the end — just to see what character names were still being talked about to see if they survived the book or not. Once I saw a couple of them still talking, I quit spoiling it for myself and went back to reading. When I was done, I went outside, found a pair of good stout sticks and began to wail on the bushes and trees (all whirling double-scimitar style) while I contemplated what on earth I’d just read. I did that for DAYS. It was summer break, I was 13, and I lived in the country. What the hell else was I gonna do? I’d written a couple of small, throwaway short stories earlier that year and figured out that I really liked it. Liked writing my own stories as much as I liked reading other people’s stories. Pieces of the puzzle began to fall together while I slapped tree branches with sticks and envisioned epic, chaotic battles in my head. 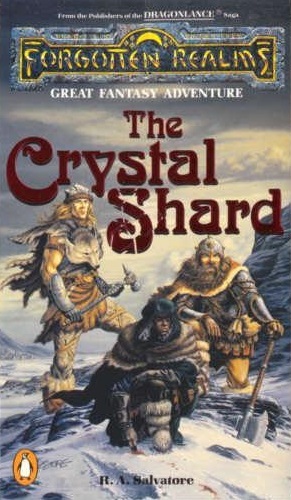 Something about “The Crystal Shard” — the story itself, the characters, and especially the little blurb in the author’s bio at the end, announcing that this was his debut novel — it convinced me that not only did I REALLY WANT to write stories (especially Fantasy stories), but that it was OK for me to want to write these stories. It was cool. It was awesome, in fact. People actually did this. I could do this too. Not that I was ready to start turning out prime Fantasy literature at the tender age of 13, mind you. Of course not. But for some reason, when I read THIS book and saw that it was this R.A. Salvatore guy’s very first novel — that was a truly life-changing moment. I can’t tell you for the life of me what seemed so approachable about this author. I didn’t know a damn thing about him outside of what was written in his bio. Up to that point, my knowledge of fantasy icons included guys like Ed Greenwood, and even in 1989, he was as enigmatic as Gandalf and Tolkien and George Lucas to me. Those guys were like, freakin’ Wizards, both actual and metaphorical. That wasn’t me. I was just a kid from the Ozarks who loved Fantasy and Science Fiction. If “real” guys like this could make awesome fantasy worlds… maybe I could too. As I grew up, and read more, and wrote more, and understood more, I came to realize just how much R.A. Salvatore actually taught me about writing fantasy. And the most important lesson of all that I learned from the stunning works of R.A. Salvatore? Better get crackin’ — this stuff isn’t going to write itself. Thank you, sir. I owe you some waffles. Hopefully one day I’ll get a chance to pay the tab.